After our first date, my husband and I sat up all night telling each other the stories of our lives. It was dawn when we finally shared our first kiss and said goodnight. From the time we first met, a little over a week earlier, I had felt both excited and comfortable with Steve. 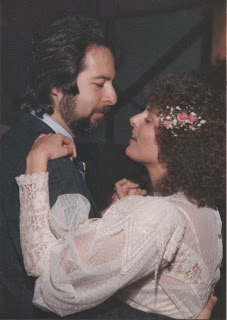 We connected right away, not just because of mutual attraction, but because we were able to communicate almost immediately in an open, concise way, and because we shared a somewhat quirky sense of humor. I felt that he "got" me, and I think he felt the same way about me. That all-night conversation, in which we honestly shared so much personal information, was a bonding experience that brought us closer together than many couples are even after dating for a few months. After that weekend, there was no doubt that we were together. Of course, it's possible to experience a close relationship with an attractive person without wanting to get married. Choosing a life partner is serious business, and "he makes me laugh" would never be enough to get me to sign on the dotted line. What did it for me, aside from being madly in love, was that I trusted him more than anyone else in my life. My trust in Steve was based on evidence, not just infatuation and wishful thinking. We had been introduced by a dear friend who had known him for a long time and who had nothing but good things to say about him. He introduced me to his friends right away. In fact, our first date was a night out with his best friend and that friend's wife. Within a short time, he brought me to a holiday dinner with his family. Not long after that, we had Christmas dinner with my family. (My grandmother pronounced him "a nice appearing young man".) I visited his workplace and met his coworkers. I knew where he lived. He was always where he was supposed to be, when he was supposed to be there. When he said he would do something, he did it. He talked about the details of his life, and never appeared secretive or evasive. He was eager to make plans together. He was generous but not extravagant, and practical but not rigid. He was always gentle and considerate with me, and I could see that he also treated others with courtesy and integrity. And ‑‑ so important ‑‑ he wasn't trying to change me. He loved me exactly as I was. I had complete faith that this was a man who would keep his promises, who would always be there when I needed him, who would always have my best interests at heart. Together we would be able to face anything in life. I imagined what it might be like to grow old together, and I could easily picture us in the distant future, gray-haired, a bit wrinkled, still holding hands and smiling at each other. And here we are, 28 years later, showing some gray and a few wrinkles around the edges, just as predicted. When we woke up this morning, Steve put his arm around me and I rested my head on his shoulder. We smiled. Rosemary, this is beautiful and got me choked up. I think that being able to talk to each other openly and honestly is essential. I think infatuation can be felt with almost anyone - heck, we have to keep the species going, right? True love is different and deeper. So glad you and Steve found (and maintain!) it! "To always have my best interests at heart." I wish everyone remembered that every day. So much pain would vanish instantly! To love is to have your best interests at heart. Great post!